In 9 Months, I lost over 3 stone. All the previous niggling injuries I had that would flare up if I went walking/hiking/cycling slowly disappeared. I began to feel stronger and my lower back pain disappeared. I started to weight lift again as part of my rehab and this is where I began to see the most significant changes. I had always been strong but struggled with the most complete test of strength, the deadlift. Navé Yoga is excited to host international yoga instructors Trevor Gribble & Amanda Farrell for a foundational 3-hour Acroyoga workshop. This workshop will be great for beginners or experienced practitioners alike. Bringing a partner is unnecessary but welcome; there are plenty of us to play with! We are delighted to welcome Lalit from Himalaya Yoga Valley in Cork to Navé Yoga again this year. 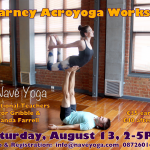 Learn to backbend with strength & integrity in this workshop with Yogacharya Lalit.